There is a policy, which states that a child born in Australia will have the same visa as their parent(s) have. There is no need to apply for a visa, but you’ll have to request a department for a visa proof. Please keep in mind it works this way only if the child is born in Australia. Another story if you want to get a visa for a kid born overseas or add your partner to 457 visa. The same apply for TSS visa. Visa holders have an obligation to report changes in their family composition in Australia. You must let them know about the fact your baby was born, it will not happen automatically. Adding dependent to your visa is your obligation. Babies born in Australia are considered to have the same the same visa as their parents. There is no fee to be paid for a visa for the child. First of all, you’ll have to organize a passport for your child. It’s quite difficult to get a visa if there is no passport or another travel document available. Letter from an employer that they do agree to extend their 457 visa obligations to your child. Health examinations are not required for adding a newborn baby on 457 visa. So even if your kid is facing some health problems, health waiver is not required. If your 457 visa application has been lodged but has not been finalized yet, and your baby was born after you lodged it, attach a Form 1022 and the full birth certificate to ImmiAccount so that your ki will be added to the application. If your 457 has been granted but your child was born before visa grant email the 457 mailbox with the documents mentioned above. If your kid was born before you have lodged 457 visa application a new subsequent entrant visa application will be necessary and relevant fee is payable. If you will take your kid outside Australia before a baby will get their own 457 visa, you can still email a 457 visa application overseas. Personally, I wouldn’t let a kid go overseas without a visa. Get prepared for questions at the airport and if anything will go wrong and visa grant will be delayed or refused for some reason you’ll be stuck with your baby overseas. From the time of visa request to the grant, it may take a couple of weeks at least. If you are stuck overseas and in the hurry you may opt to lodge for another visa such as a visitor visa, but in this situation, you’ll have to lodge a subsequent entrant 457 visa application and pay AUD 1000+ for a visa fee later. If the kid has been born overseas you’ll have to lodge a subsequent entrant 457 visa application and pay the visa fee. Keep in mind that the whole visa process will have to be followed along with medical tests. It may take a couple of months for a visa grant, so sometimes it might be a good idea to apply for a visitor visa first and then lodge a 457 visa application once a kid in Australia. In general – don’t go overseas if you are expecting unless you have to. Contact us if you need a professional assistance with a visa for your newborn. we are here to help. Feel free to add the comment to a section below. 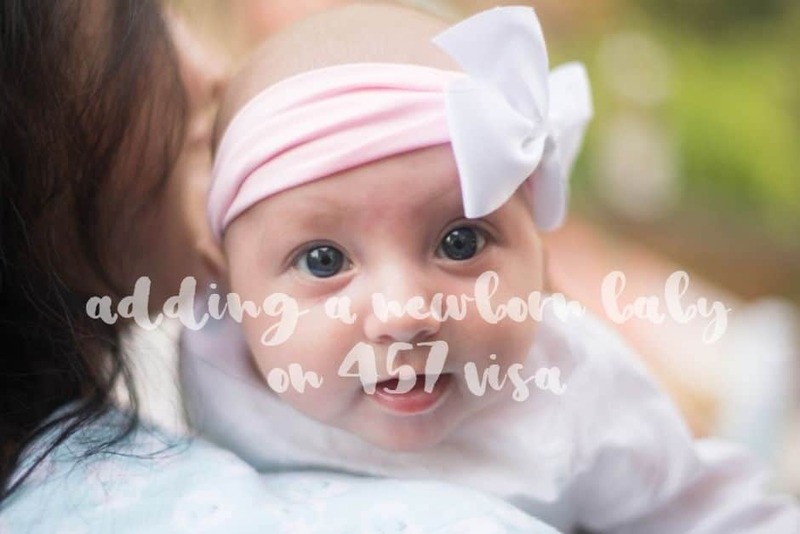 Adding a newborn baby on 457 visa. There is a policy, which states that a child born in Australia will have the same visa as their parent(s) have. There is no need to apply for a visa, but you'll have to write to the department for a visa proof. Please keep in mind it works this way only if the child is born in Australia. Dependant on department’s workload – usually few weeks. I have my baby born in india and i am on 457 visa when i am applying online this message appears, i checked all details are correct. please guide to lodge application correctly. Family member Baby name cannot be identified, check the provided details and correct if necessary. The application will not be able to continue until the family member is removed from the application. The applicant should review our website for further information. It’s hard to say what’s going on from the limited information you have provided – there could be few different reasons. Please book a consultation and we’ll have a look at your situation. I’be just returned to the US with my daughter for a visit. She was born in Australia. We thought we had this all done but were informed at the airport that is not the case. I’m trying to get everything all sorted while I’m here in the US. I have all originals of necessary paperwork. Am I best to go to Australian consulate here and get it sorted (there’s one within a couple hours’ drive of where I am). If not, what is by best option for getting this sorted asap? We could help you resolve the issue if you would unravel the mystery what need to get sorted, please? Hi, I have applied for a dependent 457 visa for adding ny newborn. 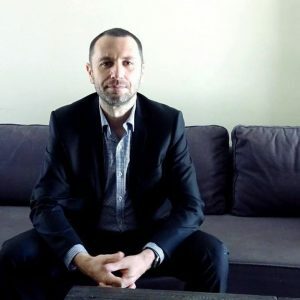 We are from Jordan, how long does it take to get the visa?there is any possibility to get it less than month? If your baby been born overseas, chances are slim that visa will be granted in less than a month. First of all, have you got a passport done already? Yes, she’s already born in Australia and she’s already has the passport? Can you please inform me how much your fees and the government fees also? For a baby born in Australia, there are no government fees usually, our fees depend case by case. Please book a consultation so we’ll discuss the way forward. Yes, she is already born in Australia, and she is already has the passport. Can you please inform me how much your fees and governments fee also? If she has been born in Australia, she is deemed to have the same visa as her parent(s). there is a special process to get her visa and there is no fee for a department. We can get her visa sorted for you. Please book a consultation so we’ll discuss the case do the job for you should you wish to proceed with our services. We have added our baby who is born in India to our existing 457 Visa this week along with medical examination. How long might the processing take place. How long might the processing take place.Is there any way to make process faster ? You can ask a department for a priority processing if exceptional circumstances exist. I want to apply for a 457 visa to my son. He is born in India. Please let me know which form I have to fill and Is it possible to apply through online? for a kid born offshore, you’ll have to lodge a subsequent application. Can be done online. Let us know if you’d like to engage us in a process. I want to apply for a 457 visa to my son. He is born in Australia. Please let me know hoe apply through online?